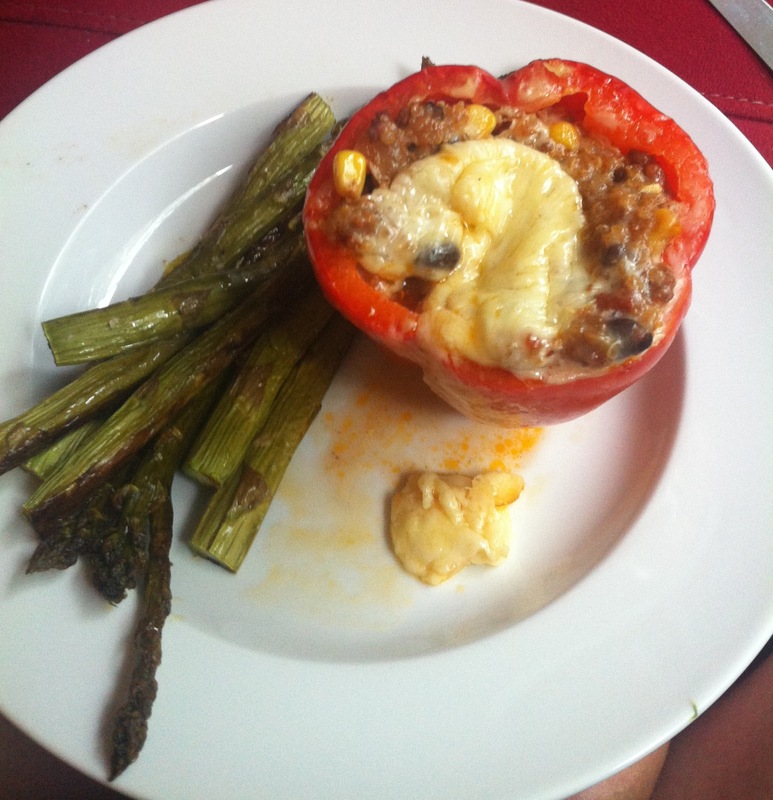 Pardon the photo – my pepper tipped over and lost some of its cheese. Preheat oven to 350 (F). Combine quinoa, water and beef stock in a small pot over medium heat. Cook until liquid is absorbed. While quinoa is cooking, add olive oil in a large skillet and saute onions. When translucent, add ground beef. Fill each pepper and top with cheese. Cover in foil and bake for 40-50 minutes. Cook uncovered for another 5 minutes if you like your cheese browned. First, we have learned to see that food is not a ghetto, it is a door. You can use food to talk about the environment. You can use food to talk about culture. You can use food to talk about politics. And people took a good hard look at how their food was being produced, and they didn’t like what they saw. They didn’t like the way chemicals were being used on apples, and they didn’t like the fact that we were feeding cows to cows. But what’s driving it now is not just fear but pleasure—people have found that food gives them a lot, it gives them things that they aren’t getting elsewhere in their lives. 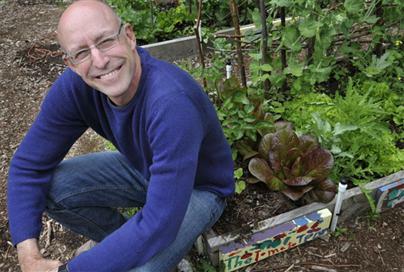 Is Urban Ag Economically Sustainable? The sober reality is that most urban agriculture projects are underfunded, understaffed, and confronted with difficult management challenges. Urban agriculture is not seen as the “highest and best use” of vacant land by most local government policy officials who would like to attract “better” tax paying uses on this land. The conventional view is that food production is something that takes place and belongs on rural land and requires a lot of it to create a profitable enterprise. Unblight.com has a thoughtful post over on their site: “Food for Thought: The Promise and Disappointment of Urban Agriculture in Low-Income Communities“. I have rolled the questions of economically sustainable urban agriculture in my head for years now. What do you think? Is this a passing fad? Can it work without subsidies? Is the financial bottom line the only measure of an urban farm/garden’s success? I’m interrupting your apparent subscription to youtube to bring you a delicious dinner plan. My absence has a few reasons behind it. I’ve started my last semester of graduate school (yay!) and have been caught up with a nasty cold and overall fatigue that doesn’t seem to be letting up. The only good thing about it all is the 9-10 hours of sleep a night I’ve been getting. I’m sure I’ll have some more things to say once seed starting begins. I haven’t been cooking a lot lately so I’m really geeked about tonight’s dinner. We’ve been eating a lot of pita pizzas, which are amazing and simple, or roasted chicken, but I really needed to shake it up. Heat a splash of olive oil in a large pan, add Julienne sweet onion and toss. Cook on low until caramelized. Set aside. Toast buns (we use the onion pan for the everything). In a large bowl combine chicken, shredded cheese, bread crumbs, egg, BBQ sauce, and spices until well mixed. Heat another splash of olive oil in the large pan, add the burgers (don’t crowd them) and cook for 4 minutes. Flip and cook for another 4 minutes. Add cheese to the top (optional) and put a lid on the pan to finish cooking. Even if you like medium well burgers, heat until at least 165(F) because this is poultry. Plate on toasted buns, top with caramelized onion and extra BBQ sauce. 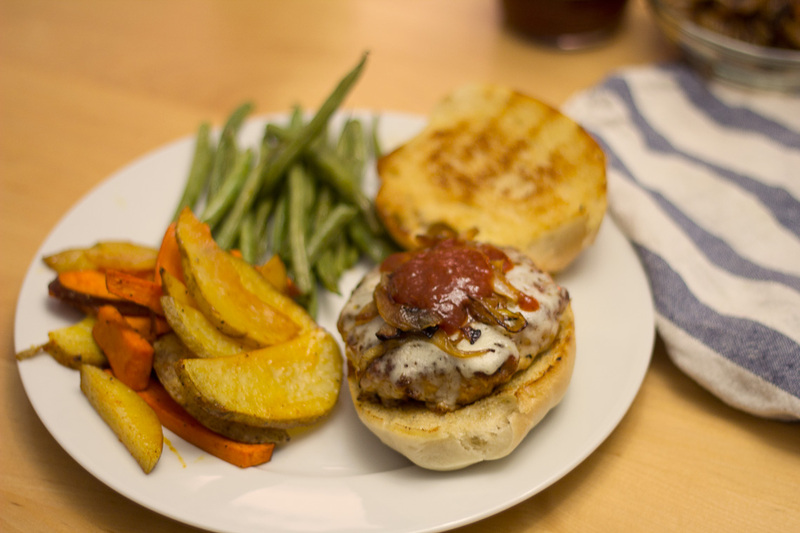 I served these with two sides, roasted green beans (tossed in olive oil and salted) and roasted mixed potatoes. Both and be placed in the oven before you start the burgers at 375(F) and should be done on time. We jokingly call our mixed potatoes “oven fries” but they never turn out crispy because we always overcrowd the pan. Delicious none the less. We slice up yukon and sweet potatoes, soak in a little cold water to wash away some starch, dry them, toss in olive oil with some salt, pepper, and paprika.